News4 has obtained video of an 18-year-old woman confessing to stabbing and killing a 15-year-old girl she believed was responsible for her boyfriend's killing. Venus Romero Iraheta pleaded guilty to the murder on Monday, the one-year anniversary of Damaris Alexandra Reyes Rivas' death. Iraheta is one of 10 young people charged in Reyes Rivas' death. 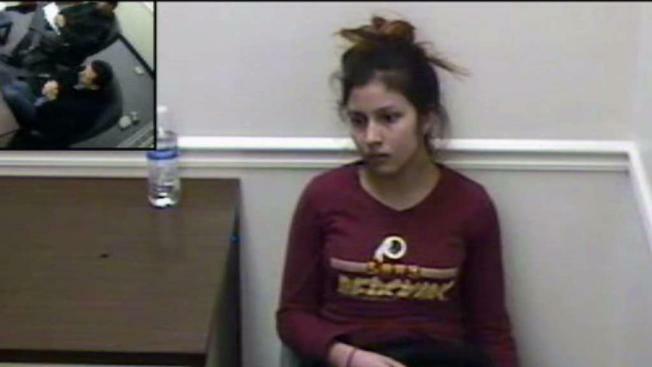 In an interrogation video from Fairfax County police, Iraheta tells investigators in Spanish that she told Reyes Rivas, "You're going to remember me until the day we see each other in hell. Don't forget my name. And I told her my full name and I told her my nickname. And I told it to her and I told her to never forget who I was. I told her someday we're going to see each other again." The investigator then asks, "And then what did you do?" Iraheta responds in English, "I killed her." She goes on to say she stabbed Reyas Rivas about 13 times. The brutal killing was recorded on cellphone video and shown in court. Iraheta also told investigators she sliced off the girl's tattoo, according to testimony. "I remember that before stabbing her, Jose Torres told me to cut her tattoo off," she said. The detective later asks her if the killing bothers her. With a straight face, she shakes her head, signaling "no." Just hours before her chilling confession, News4 was at Iraheta's mother's home where the teen returned from being on the run. Her mother had reported her missing. The two hugged and cried. Police arrested Iraheta moments later. "Just pure evil," Morrogh said. "To torture to death a 15-year-old girl, it staggers the imagination." Reyes Rivas left her home in Gaithersburg, Maryland, Dec. 10, 2016. She had told her mother she was being threatened by gang members at school. The night of Jan. 8, 2017, Iraheta and nine other young people allegedly took Reyes Rivas to an area near Lake Accotink Park. They then assaulted and interrogated her about the recent murder of Christian Sosa Rivas, whose body was found Jan. 12 along the Potomac River in Dumfries, Virginia, police said. Sosa Rivas was Iraheta's boyfriend. The deadly attack on Reyes Rivas was recorded, and the video included footage of her being tortured and stabbed. The video was shown Monday during Iraheta's hearing, as the victim's family wiped away tears. They recorded the video to send to MS-13 leaders in El Salvador with hopes of being promoted in the gang, Morrogh said. "It's kind of like a trophy they take," he said. "They show it off to the other gang members." Investigators portrayed Iraheta as bent on revenge and wanting to inflict some of the fatal wounds herself. The FBI special agent who questioned Iraheta after her arrest testified that Iraheta blamed Reyes Rivas for luring her boyfriend to his death. The night they took Reyes Rivas, the group forced her to stand in the snow with no shirt or shoes so she would "feel as much pain as Christian." Iraheta faces a maximum of life in prison plus 20 years when she's sentenced May 25. Morrogh plans to seek a lengthy sentence. Seven of the 10 people charged in the case have been convicted or pleaded in guilty, including three other suspects who pleaded guilty in October. Cindy Blanco Hernandez, 19, pleaded guilty to two counts of abduction by force and the abduction of another juvenile female in early January. Aldair Miranda Carcamo, 18, pleaded guilty to gang participation and two counts of abduction by force. Emerson Fugon Lopez, 17, pleaded guilty to abduction in connection with Alexandra's death and gang participation. They are set to be sentenced May 5. Morrogh hopes these prosecutions help halt the surge in MS-13 violence.